If you aren't familiar with Tampa, you might think this photo was taken somewhere in the Middle East or North Africa. 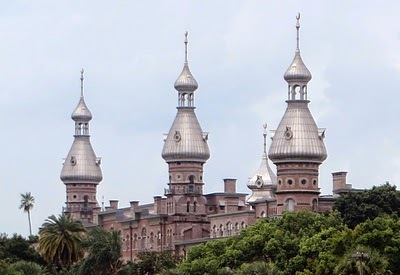 It's the main building of the University of Tampa, situated near the west bank of the Hillsborough River, across from downtown. I took the photo from The Tampa Riverwalk, which follows the river's east bank. The building was originally the Tampa Bay Hotel, designed by the architect J.A. Wood and completed in 1891 for the railroad and steamship magnate Henry B. Plant, who had completed a railroad connecting Tampa to points north and established Port Tampa as a terminal for steamships sailing to Havana, Jamaica, New Orleans, and other destinations. In 1898 the hotel became the headquarters for the U.S. military campaign to liberate Cuba during the Spanish-American War, and Colonel Theodore Roosevelt stayed there before embarking with his Rough Riders at Port Tampa for their voyage to Cuba. The building is now a National Historic Landmark. Going along the Riverwalk, I found this bust of Plant, with his hotel in the background. Plant was responsible for making Tampa, which before the 1890s was a small town, into a major transportation hub and tourist destination. 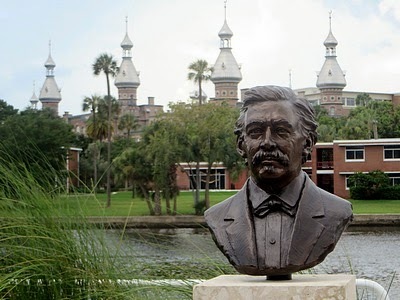 He died in 1899, and his heirs sold the hotel and surrounding grounds to the City of Tampa in 1905. The hotel continued to operate until the depths of the Great Depression, when the City leased it to the University for 100 years, at an annual rental of one dollar. It now contains classrooms and administrative offices, and a portion of it houses the Henry B. Plant Museum. An environmentalist before that word was coined, Kate Jackson made many contributions to Tampa. At a time when women could not vote, she led the lobbying for essential public services. 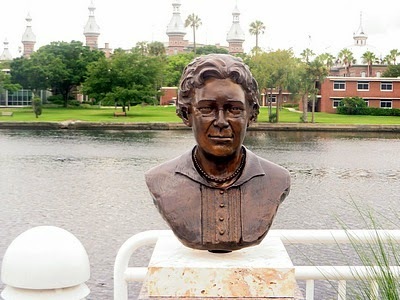 Parks and playgrounds were her biggest achievement, and the Tampa Civic Association, which she founded in 1910, was a major factor in creating the city's first water and sewage system. This sanitation was key to preventing yellow fever epidemics that had plagued the area. She was born in Tampa to Irish immigrants who had arrived in 1847. Because Tampa had no good schools at the time, she was educated in a Key West Catholic institution; this led her to recruit the nuns who built the Academy of the Holy Names in the 1870's. An astute businesswoman, she also was a generous philanthropist. Jackson's influence was statewide, especially via the General Federation of Women's Clubs, which was the first organization to preserve the Florida Everglades. Although I spent my youth in Tampa, I had never heard of Kate Jackson. Her contributions to the city's history, though, rivaled those of H.B. Plant.